a part of Onigokko, by Gintoki Sakata. Gintoki Sakata holds sovereignty over Homurahara Occult and Horror Clubroom, giving them the ability to make limited changes. 646 readers have been here. Homurahara Occult and Horror Clubroom is a part of Onigokko. Keiza looked on as he began to survey the room and take in what had just transpired. He remembered everything that happened before the club began its activity and he could recall the words spoken before everything had gone to hell. A mentally niggard rub of his cheek and he was not surprised to feel the same warm sensation get drawn under his fingers. It seemed that the world had gone on for so long and the dust pattered on top of everything attested to this. Withdrawing his hand to see the red stain draping across the underside of his fingers. All he could think in his mind was how it was definitely sad that such an event happened to Justin. Such a horrible way to go* Was that kept running in his thoughts. Though he was also rather glad that he was not at the brunt of such an attack, knowing that at least Justin's death could serve well enough in that regard. Discarding the mark on the thigh of his pants Keiza pulls another ragged cough from his lungs before clearing it finally. The world now seemed so stale in comparison to what he was used to, it possessed no life and movement like the waking side of things and all he could do was fight back the urge to pull the fresh pack of smokes in his pocket. Catching the sound of Akira clearing her own throat behind him he turned to check on her well being, only to be greeted by the sight of her head rolling nearly a foot from her body and his own faculties seized up for the moment. Another strange and somewhat shocking aspect to register for him this night. Though he could not lie, there was a measure of fascination that came with the realization of what was happening. She on the other hand was not the least bit caught off by what was going on, in fact it seemed to be a natural occurrence to her. The way she meandered on the act of reaching around for her head as her body shuffled about flailing that one arm lightly. Managing to pull himself away from the sight long enough to turn back towards the front of the room, just as she managed to wrap her hands around her face and pull it closer. He doubted the fact that seeing her reattach her own head face to face would be an easy discussion, no matter the day or time. Deciding that he should wait for her to knowledge him before first addressing anything else and so he could at least steel himself for what was to come. He had always felt somewhat sorry for the young girl, never being really one of the other kids in the school. She was well liked by her friends yes, but those friends were only of the class and only those close enough to her. She kind of reminded him of himself as a child, only the fact that life was less friendly in those days colored his view more turgidly. "T-Teacher... You--" She asked as she rose up from the floor, Keiza could only imagine the ample puppy eyed look she was trying to swing his way. She questioned what he had seen and what was going on with the world and them. Though he was aware of how unfazed the rest of her questioning was. The same face and action he had seen time and time again as a teacher when children were caught doing something they knew was wrong and how they tried act as though they did not know what was happening. Only when her attention shifted on to her class mate Shizuka did her expression and worry become more genuine. Keiza looked on as she tried to wake Shizuka, but to no avail for the time being. He put a hand on her shoulder and spoke "If we are any indication, I believe that thing wants us here alive and well.. for the time being at least." He leaned down and helped her move Shizuka over on her back and took the moment to inspect her more closely. As far as he could tell she and the others were unharmed, so much so as himself and Akira. That was when he returned his hand to the young girls shoulder and spoke to her closely. "Playing coy will help no one for now Akira, I saw enough.. But for now lets make sure the others are at least going to wake up." He gave her shoulder a gentle squeeze in a measure to reassure her at least. Though there was no smile or calm look to be found on his face, because in all honesty he was not sure of anything while they remained here in this place. Darkness. It's what Kaoru saw when everything just stopped, after the club president fell, when the vice president was cut in two, just like a fruit about to be eaten. The raven-haired male's head was pounding, like someone slammed it into a wall. He blinked. There were fewer people in the classroom. He tried to stand up, but his back was in serious pain, and he didn't feel his left leg. Hopefully it wasn't broken. Kaoru pushed himself up with his arms, but the process was stopped by the fast panicking of "Sh-Shizu... Get up... Please don't be d-dead! You said you wouldn't leave me alone! Wake up, wake, up... wakeupwakeupwakeup!". He dropped back to the ground, and stared at Akira. Well this was a problem. "Uh, hey. maybe you'd wanna explain... ya know, the head thing? And do you two have any idea where we are...? I need to get going." he said from across the room. Assembled in a circle along with the rest of Occult Club's members Shizu could only watch on with a raised brow as Haruka chanted aloud some strange incantation from an equally strange looking book. She wasn't sure where the president found such an odd thing nor what possessed her to trying to get the whole group involved in whatever ritual this was supposed to be. Whether it was real or not the president at least put some actual effort into the whole thing and if her aim was to set a creepy vibe she certainly succeeded in at least that. 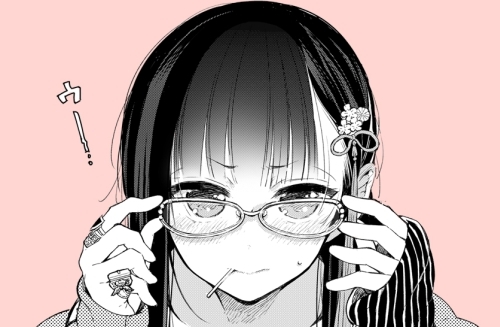 As silence finally fell over the room Shizu blinked, nothing happened, as she expected but she would be lying if she said she felt no suspense at the conclusion to the rather dramatic reading that had just taken place. Feeling her shoulders relax she began to glance around the room at the others before Justin's shout drew her attention. In the blink of an eye the boy had tackled their president and as Shizu's gaze followed the boy's movements they stopped upon identifying a strange shadowy figure occupying the space behind where the president stood just a moment ago. Confusion and paralyzing fear took hold of her body as she could do not but stare at the unknown figure. The red light emanating from the circle below her began to envelop her vision accompanied by a pain that began to embrace every inch of her being. Red stained vision darkens. Crimson. Blackness. Nothingness. Am I dead? I mean I knew it was gonna happen sooner or later given my health but... This is a little ridiculous don't you think? It's way too early for me to die. It's no fair. I refuse to accept it. I haven't even kissed anyone yet. Well, no one real anyways. Suspended in blackness with only the silence of nothingness to answer her thoughts, Shizu floated about in unconsciousness. Some unknowable amount of time later Shizu finally heard something. Distant, muffled shouts, incomprehensible but with them came a looming consciousness. As the sounds came into greater focus she could feel herself being moved. It was still hard to make out -what- was being said but she could make out three different, distinct voices. One was certainly Akira, the other Keiza-sensei, the third however she was unsure of, some boy from the sounds of it. With her head still feeling a fraction of the pain from before Shizu inhaled deeply as she finally resurfaced into the world of consciousness. The dusty and stale air that filled her lungs sent her into a short coughing fit as she slowly sat up, one hand behind her planted on the ground to support herself. As the coughing settled she opened an eye and gave a cursory scan around the room before opening both her eyes and squinting up at Akira who appeared to be crying. Seemingly out of habit more than anything else she reached for her pocket to retrieve a sucker to pop into her mouth before she adjusted her glasses. "Guess I'm not dead then... What... What happened? What're you crying for? Are you alright?" Her first question was addressed to the whole room as she looked over at the two other men who were awake before she returning her slightly concerned and mostly confused gaze to Akira. "If a sacrifice is necessary, Ayame would do," Maina thought to herself as she watched the blonde girl down more cookies than one could count. It was somewhat amazing how someone with such a slim figure could possibly eat so much, but the little red-head, Milo, was capable of eating just as much, only not in such a timely fashion. Ayame's gluttonous behavior quickly triggered a reaction from the baker of the Horror Club, and within moments the two were leaping out a window. This was the sort of activity that gave the club it's unique reputation, but it also made it more entertaining. It wasn't long before their just leader was ready to begin, the shenanigans caused by Ayame barely making a dent in Haruka's plans. As they gathered around in a circle, the two club members who'd leaped form the window returning and looking rather soaked from the rain, there was an odd feeling slowly building up in Main's chest. She couldn't quite figure out what the feeling was, and chose to ignore it as best she could. If she'd been aware of the events that would take place as soon as the passage was finished being read, perhaps she would've changed her mind about participating in this activity, but how could any of them know that a tragedy was soon to take place? Every other activity that Haruka would throw at them only ended in mischievous fun, but it seemed their president had dug a little too deep this time. Maina's eyes may have been the first to lay upon the shadow that Haruka had likely summoned before Justin pointed it out. Normally, Maina would instantly shift into a fighting stance and ready herself for danger, but as the circle drawn on the floor began to glow a fierce red, she found she'd lost all control of her body. The feeling that had been itching at her only seconds ago made sense to her now as she struggled to move even an inch, but it only took a second for her to forget about the restraint put on her muscles as Justin was sliced in two. The only thought running through her head now was whether the shadow would kill them all now, or if Justin was a mere sacrifice for the start of something more sinister. She clenched her teeth, the only movement she was capable of preforming at this point, as pain shot through her entire body. It seemed like it would last for hours, but as darkness engulfed her, she suddenly felt like her body no longer existed. The sounds of her classmates blurred and vanished until there was nothing left. "Oi, Hawke....wake up shooting rather than swinging..."
Dark lashes quivered gently as Maina's consciousness began to restore itself. She could hear a familiar voice, albeit faint, and her skin felt somewhat damp as if the air around her was heavy with liquid. Her eyes opened and she stared at the dark sky for a moment, moving her fingers and toes to make sure the numbness she had felt before had left her. Thankfully, she could move again, and the forced herself to move into a sitting position. "I won't accept any friendly fire." That was Troph's voice. She turned her head in the direction the sound came from, making out two shapes that looked to be Varren, still unconscious, and the fedora wearing gamer that was trying to shake Varren awake. Maina picked herself up off the ground and brushed off her skirt, strands of grass falling around her feet as she did so. Taking another moment to examine her surroundings, she could see the body of Shizuka laying on the ground only a few feet from where Maina was. The older girl seemed unharmed, which gave Maina a sense of relief, and would likely wake up soon as well. Maina decided she would make her way over to Troph first, since they were the only two conscious at the moment, to let him know that she had come to. "It's apparent that we're outside, but this place isn't familiar to me." She stopped beside Troph, her eyes scanning the surrounding area. She could barely make out the shapes in the distance, but felt no need to activate her hawk eyes. Not at this moment, at least. They'd be exploring the area soon enough, anyway. "Troph-san, do you have a marker on you by chance? Preferably a permanent one," she said as she knelt down beside him, resting her eyes on Varren's face as she spoke. Varren had to gulp down the urge to break into laughter when Troph’s unrelated mother chased another club member, Ayame, out of the window. They both had the ability to defy the laws of gravity, and gracefully landed on the ground three floors below them. After things settled down, and the crook and her corresponding cop returned to the clubroom, Haruka got the show on the road. The young man hadn’t expected to bear spectacle to what he saw. The display the president put on was definitely breath-taking. But by no means was it in a good way. Throughout the duration of the experience, Yinyues was attempting to piece together the order of events. First, a rhythmic chanting narrated flawlessly. It was like many which had been performed by the club in past years, but they never turned up with any results. Once the reciting had ceased, only the ordinary ambience filled the classroom. It was no other than Justin who broke the silence, Varren swiftly traced his line of sight to the shrouded figure creeping behind their president. Next, the friend who he was just teasing a few minutes prior was hastily killed off, words still attempting to leave his throat as he was sliced in half. The young man could barely keep his eyes open under the immense pain and pressure. His gaze shot to his closer friend mates, seeing them in the same state of unrest. Before he knew it, the student had succumb to the overbearing feeling. His body was completely frozen in place and was unable to move even a centimeter. It felt like he was being constricted, strangled by the effects of the cantation. And then, the student’s ability to retain consciousness faltered. Varren’s eyes were forced shut, and his mind fell into a void of darkness. ”Come on, open damn it. What, did you forget to work out your eyelids? ...Actually, I really need to get into working out. I think I’ve gained a few pounds rece- No. Varren, keep your head on a swivel. First, assess what you have at your disposal. Four out of five senses are operational. Use them.” The young man gritted his teeth as he began to regain his sense of touch and smell. Whatever surface his back was resting on, it was damp. He didn’t wet himself, right? It’d be even worse if somebody else took a leak on him. But given the heat and lack of smell, such a claim was crossed out. So it was just ordinary dew, accompanied by a chilly climate and heavy atmosphere. His fingers began to tingle and slowly wrapped themselves around blades of grass. [i]”Forest. Outdoors. Troph-san’s worst nightmare. If he’s here right now, I’m sure his heart will break if there isn’t any WiFi nearby.” The hairs on the back of his neck brushed up again the cool terrain. The feeling helped to spur his mind, but only by a little. Soon enough, his ability to hear returned. ”He knows I fairly disliked that movie. Hawkeye would never kneel before a deity. He’d shoot an arrow at his knee.” Varren began to regulate his own breathing, then felt himself suddenly thrashed around by Troph’s incessant shaking. [i]”I swear, if this guy was an EMS. He would shake the patient to death, and accidently bash their brains in. Something along those lines. Alright, back to gaining control of feeling. Joints are a little… stiff. Kinda sore, actually. Not even sure if I really want to wake up now. I mean, the ground is pretty comfortable. But I do have to find out what happened to Justin, Pres, and everybody else in the club. Although, that could wait until lat-” His ears picked up the sounds of approaching footsteps, another individual leaned over Varren. And with that uttered, Varren’s self-defense system enacted protocol. It quickly switched into gear, prioritizing adrenaline supplementation over other bodily processes. His eyes flung open and were instantly fixated on the white-haired student, Maina. He furrowed his brow and jutted a finger at the girl, ”I swear on whatever deity that cold heart of yours puts faith into, if you attempt to even draw on par with Leonardo, it’s gonna hit the fan. And by it, I mean Yotsuki-san’s cooking. Wouldn’t want to throw away gifted creations, now would we?” He sat forward and let out a sigh, taking in the surrounding setting. His presumptions were correct; they were indeed inside of a forest of sorts. Clouds of mist floated around them, obstructing any farsighted vision. He was barely able to make out the structure of a building to their six o’ clock, but its decals were blurred out by the fog. Troph began to get agitated as his attempt to rouse the hibernating Varren seemed fruitless. It wasn't until a voice spoke out, that Troph gave up. With a startled jump, Troph turned back to see Maina making her way over to him and Troph. 'Well that saves me the trouble of waking every one of these lazy bums up.' Troph thought, as he stood up to meet her. "Yeah. This place is pretty weird. Its almost as if we were sucked to another world." Troph stated nonchalantly, once again taking another glance at the building atop the hill. If there were answers to be found, that was definitely a good place to start. To Troph's annoyance, his childish thoughts were interrupted by a question from the newly awakened Maina. "Troph-san, do you have a marker on you by chance? Preferably a permanent one." Troph stared at Maina with a blank expression for several seconds, before finally acknowledging what she was getting at. The mischievous glare in her eye diminished any mystery there was to be found in her question. "What do you know? It just so happens that-... Ara?" Troph began to reach into his pocket confidently, only to pull it out in surprise. Upon opening his concealed fist, Troph's palm withheld a single portable charger. "Huh. That's strange. I must have grabbed my charger instead of the sharpie..." Troph explained, while rubbing the back of his head, sheepishly. Troph hadn't been the least bit surprised when Varren awoke, no doubt on high alert. 'It seems that he still remembers...' Troph's face paled at the memory of Varren's rage-infused torture, once he found out that Troph had been the one egging Maina on with their little prank. "Adopted mother? You mean Yotsuki-chan, right?" Troph looked over to the unconscious baker with a tinge of worry. While Troph had forced the embarrassing nickname on her, he usually only referred to Yuzuki as "Mama" when he was speaking to her directly. Kneeling next to her, he gave Yuzuki a couple of light slaps on the cheek. "Mama. Varren is bullying me again. Wake up and nail him with your ladle." Troph stated in an almost monotonous voice. It was then that a sudden tension inhabited the air. It felt similar to the way the shadow from earlier did. Oppressing and deadly. Taking a look back, Troph tilted his head to the side in disbelief. "What are those things? Fishmen? Murlocs? These must be the basic mob creatures for this area." Troph speculated, while reaching for a switchblade that was strapped to his belt. Flicking it out and holding in the general direction of the sickening creatures, Troph readied himself for whatever action the group chose to take. Whether it be fight or flight, Troph was ready. Keiza stood from Akira's side and looked around the room once more as they began to regain their composure. It was a troubling thing to witness the death of a friend and then be whisked away from the world you know and somehow placed in such a false reality. Though as he ran his hand over the length of his arm, the idea that this was just another world all together washed over him. That or it was terrible counterpart to what they lived in. It was then that he began to wonder why he felt so at ease in this play, besides the feeling of dread that came from their situation. All was fine inside of his mind and that was what bothered him the most. "Get to your feet and see what you can find.. we need to be ready for anything that happens here." Keiza was quick to head back to the desk at the head of the class, now sitting in a crooked position from the wall. As if it were a sharp splinter shunted from a day old wound. However to his dismay there was nothing, as he pulled the first drawer open. Save for the accommodation of dust and grime that seemed to accumulate everywhere in this place and as he kept searching, nothing became any better. Not a thing existed in the confines of the desk and that puzzled him, despite the world looking remarkably like their own. Nothing was as it stood in its entirety, because he highly doubted the homeroom teacher would have a completely bare desk. He reels back and kicks the edge of the desk in frustration, not hard in his defense, but the state of the wood was enough to splinter a nice chunk of its leg. Sending small pieces of wood flying, as if scared critters sent jumping from an open flame. However as he stands back from the desk, his back hits the chalkboard and he makes the eraser fall. Its landing does the same as most of the room, pluming out a small display of dust. Though honestly it could be chalk as well, but frankly it would be impossible to determine such a spectacle. Keiza can feel his nerves center once more as he looks at the children in his care and speak. "Sorry.. frustration is never the best of my days." Leaning over and picking up the eraser, he returns to set it back on its perch in front of the board. As if doing so would be some cosmic action that would set all things right once more. Or to set his mind at ease, because right now he could not really decide on that answer. It was at this time that he noticed something, the board was not as he or the class had left it. Though from the collection of dust he could barely see what was drawn on their now. He twist and turns his view trying to get a better look at the writing, but to no avail it was just too hidden and so chose to draw in one singular breath. He let this breath go on the board, its pressure cutting the gathered dust from its resin surface with incredible ease. What it would reveal however was all that could occupy his mind.